I’m not sure how this will go. I’ll try getting in touch with some of the orphans’ descendants who sent me material in the past. Maybe together we can give an outline of a family history that may be of interest to others, even if it’s just to suggest possible lines of enquiry. I’ll attempt some of the things I’ve suggested earlier, such as make our own presence felt, find something about the orphan’s Irish background, as well as what happened to her in Australia. And I hope, put her in some kind of historical context. I’m sure you know all this already. You are welcome to make a suggestion about the things we ought to include. This time, I’ve chosen to write something about one of the infamous ‘Belfast Girls’, Mary McConnell. I’ve been in touch with one of Mary’s descendants, Mrs Pat Evans, for more than twenty-five years; she herself has been working on Mary for more than thirty. Tricia has provided lots of information about Mary’s history. She tells me that she is emotionally close to her orphan descendant. After all, she is her great-great grandmother. It took her a while to reconcile herself to some aspects of Mary’s life but she understands her, and admires her resilience. Tricia says, ” I am able to accept that my Mary was not what we would call a good girl today and at the same time extremely thankful of what she did to survive in the harshness of the day”. We both are very grateful to a renowned local historian, Brian Andrews, who helped us put Mary’s life into context, in the Hunter Valley of New South Wales. Unfortunately I lost contact with Brian some years ago. But I see, via the web, he was awarded an OAM for his work as a local historian. Congratulations and well-deserved, Brian. Brilliant work. I’d like to keep this post in an unfinished form to emphasize that orphans’ family histories are constantly being revised. The ‘facts’ can change so quickly. “Lord Earl Grey, the British Secretary of State, thought he had the magic answer for several problems facing the English Parliament. He could rid the Irish workhouses of the orphaned paupers by supplying the Colonies with female labour and females to correct the imbalance of the sexes, which were both needed in great numbers in the Colony of New South Wales. This scheme was called the ‘Earl Grey Scheme’ and was to remove about 4,000 female Irish orphans from the disgusting workhouses throughout Ireland. The scheme was to survive for only two years. From the Belfast Workhouse, Mary, with the other ‘Belfast Orphans’, left Belfast traveling to Plymouth by the Steamer ‘Athlone’ under the supervision of wardmaster James Caldwell. The ‘Belfast Girls’ and many others then left Plymouth on the 3rd June 1848 per ‘Earl Grey’ to Sydney Australia where they arrived after 122 days at sea on 6 October 1848. Whilst on this voyage each girl was given daily rations of ½ lb meat, ¼ lb flour, raisins, peas, rice, tea, sugar, butter and biscuits. Each girl was also outfitted with 6 shifts, 6 pairs of stockings – two worsted & 4 cotton, 2 pair of shoes, 2 gowns – one of woolen plaid, 2 short wrappers, 2 night wrappers, 2 flannel petticoats, 2 cotton petticoats, 1 stout worsted shawl & a cloak, 2 neck and 3 pocket handkerchiefs, 2 linen collars, 2 aprons, 1 pair of stays, 1 pair of sheets, 1 pair of mitts, 1 bonnet, day & night caps, 2 towels, 2lb of soap, combs & brushes, needles, threads, tape & whatever other little articles (such as a few yards of cotton or calico) the Matron may know young females to require. They were also given a Bible and Prayer Book suitable for their respective religions. Then they were given one box – length 2 feet, width 14 inches, deep 14 inches, with lock and key, to be painted, & the Emigrant’s name painted on the front, & a catalogue of the contents pasted on the inside of the lid. The box was ordered to be strongly made, so as to bear a long voyage & besides being locked they should be strongly corded. The first ship to arrive in The Colony was ‘Earl Grey’ on the 6th October 1848 into the harbour of Port Jackson. The last ship carrying it’s live cargo entered Port Phillip, Melbourne on 31st March 1850 and she was the ‘Eliza Caroline’. There is also known to be four ships that sailed into the Port of Adelaide in South Australia. The ‘Belfast Girls’, per ‘Earl Grey’, as they were referred to, were classified as refractory. One of the girls (I must admit was not one of the good girls) was my Mary McConnell”. In her family history, Tricia would also say more about the voyage itself, and about Surgeon Grattan Douglass’s condemnation of the ‘Belfast girls’, and the subsequent enquiries that followed his report. I’m not going to do that here, for my purpose throughout my blog, is to give a more detailed picture of the scheme and of the Irish Famine orphans themselves, than is usually the case. Tricia’s comments have prompted me to ask how many Earl Grey descendants have read the report of C. G. Otway, the Irish Poor Law Commissioner? It’s in my Barefoot & Pregnant? volume 1, which should be available in your local library. Why do you think it has had such little impact? May I invite anyone writing their orphan family history, especially if he or she wants to delve deeper, to think about what I’ve said in these thirty-odd blog posts; about the origins of the scheme; about how the plan may belong more to the Colonial Land and Emigration Commissioners than Earl Grey himself; about how Irish Poor Law Commissioners and Boards of Workhouse Guardians arranged things at the Irish end; about Charter Parties and the regulations that applied to every government assisted voyage; about the orphans’ arrival and early days in Australia, and above all, about the ways we might try to put ourselves in an orphan’s shoes and view things through her eyes? Here’s a link to what my blog contains, http://wp.me/p4SlVj-oE If you wish to use any of it in a fuller family history of your own, please feel free. But also please acknowledge your debt in the conventional academic way. I believe that goes something like this, my name, name of the blog post and the date you accessed the site. My thanks in advance. A recently posted family reconstitution form gives us a brief synopsis of Mary’s life. And already our ‘facts’ have changed; we find the form needs revising. There is a big question mark over the names of Mary’s parents. James and Fanny are the names Mary gave to Belfast workhouse. So I’ll call them James and Fanny McConnell. Tricia recently informed me that William Ashton‘s details are also incorrect. He was not a Bounty migrant who came by the Brothers in 1841. Rather, he was a convict found guilty of highway robbery at Liverpool Quarter Sessions in July 1838. He arrived in New South Wales on board the Theresa in 1839. Tricia discovered this through Maitland gaol records and the Maitland Mercury which linked William and Mary’s name together. We should also remove William’s parents’ names and his birthplace and date from the form, and change his occupations to ‘brickmaker, sawyer, labourer, and bushman’. The other details are correct. Among descendants of the Famine orphans, the story of the “Belfast Girls” is relatively well-known. Surgeon Douglass described the ‘Belfast girls’ as “notoriously bad in every sense of the word“. “The professed public woman and barefooted little country beggar have been alike sought after as fit persons to pass through the purification of the workhouse, ere they were sent as a valuable addition to the Colonists of New South Wales”. It was a stain that’s been very difficult to remove. A detailed enquiry by Irish Poor Law Commissioner C. G Otway rebutted Douglass’s claims –as might be expected– and was supported by the Colonial Land and Emigration Commissioners in London–as also might be expected– but it was never enough to restore the good name of the rebellious ‘millies’ (Mill workers) and “gurriers” from Belfast. As far as the Surgeon, Captain, and Matron of the Earl Grey were concerned, Mary McConnell was “a professed public woman”. She, and the other ‘Belfast girls’, should not be allowed to land in Sydney. “Considering that the landing of the Belfast girls in Sydney, would assuredly lead to their final ruin, and being also impressed with the importance of separating them from the remainder of the Orphans, the Committee [the Sydney Orphan Committee] acceded to the proposal of Dr Douglass, that they should be at once forwarded into the Country” . Let me mention in passing, how much I enjoyed Jaki McCarrick’s recent award winning play, “Belfast Girls“, not as a nitpicking historian but for its dramatic sensibility, its contemporary relevance, and above all, Jaki’s sympathetic treatment of the young women. Ellen (with renewed resolve) …Remember, this is what you’re to be wed ta. Your books. Your learnin’. For Molly’s sake — let none of us waste this journey an’ all we’ve learned. You — in here (points to her head) are a great gift to Australia, an’ don’t ya forget it. We all are an’ must none of us forget it. 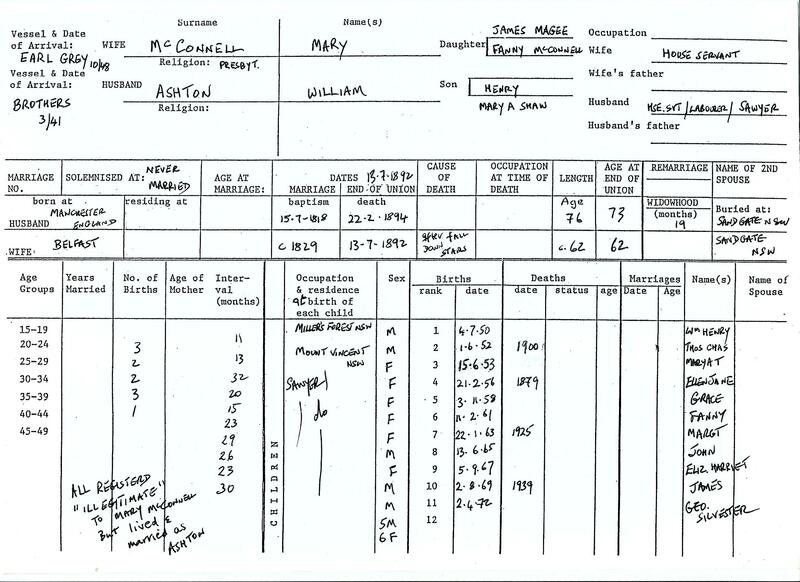 We are lucky the Otway Report has survived: it has specific information about Mary McConnell. (For more details, see Disc 2 of Ray Debnam’s CD set, Feisty Colleens). In the report, two Belfast Detective Police Constables, DC John Cane and DC Stewart McWilliams testified that none of the Belfast girls accused of prostitution by Surgeon Douglass was known to them as such. From my knowledge of young persons working in mills and manufactories, I know they are generally unguarded in their language and mode of expression, and use unchaste language, though they may not be unchaste in person, or prostitutes. I have read over the names on the list of the females sent in the first vessel from Belfast, and there is not the name of a single person that I ever knew or heard of as being a prostitute amongst them. Look at the name whose initials correspond with Mary McCann, No. 45 I had no knowledge of her as a prostitute or person of bad character, and she could not have been well known in Belfast as a prostitute without my knowing it. Given the circumstances, theirs is the kind of evidence we might expect? I leave you to decide for yourself. My view is that people today are not so quick to adopt the high moral ground; they understand how someone may depend upon prostitution to survive and others might use it for their own empowerment and material security. Maybe Surgeon Douglass too quickly accepted as truth the insults and obscene language the Belfast orphans hurled at one another. 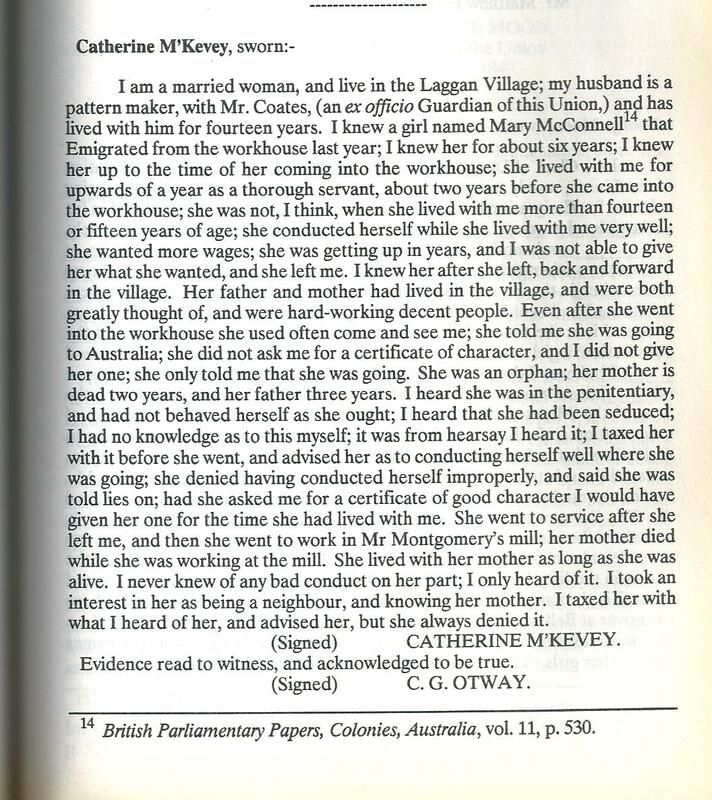 More interesting than the Constables’ evidence is the testimony of Catherine McKevey who lived with her husband, a Pattern Maker, in Laggan Village. She had known Mary personally for the six years before she left for Australia. This has an authentic ring to it, does it not? Mary’s parents were ‘decent, hard-working people‘. Mary had lived and worked with Mrs McKevey for about a year when she 14 or 15 years of age, as ‘a thorough servant‘ (i.e. doing everything). Her dad had died three years ago (in c. 1845-6) and her mum two (in c. 1846-7); ‘she was an orphan‘. ‘I heard (gossip) she was in the penitentiary and had not behaved herself as she ought‘. After Mrs McKevey’s, Mary had gone first into service, and then to work in Mr Montgomery’s mill. ‘I…advised her as to conducting herself well where she was going…‘. Sometimes family historians need to make an educated guess about what happened to a descendant. We’ve done that in some of what follows. Mary was born in Tyrone, the daughter of James and Fanny McConnell, and baptised a Presbyterian. Surely she had siblings? Maybe a brother or sister died before she and her young parents went to Belfast, in the early 1840s. ‘Jummie’ McConnell, a weaver, part of the declining domestic-putting-out system in Tyrone, and like an ever increasing number of others, was told there’d be a job and hope in Belfast. It was a city built on mud flats, and already growing into Ireland’s major manufacturing city. But in the 1840s, it was a mere fledgling of what it was to become later in the nineteenth century. The young family went across Queen’s bridge to Laggan Village, down near the Short Strand and the bottom of Ravenhill Road, in County Down. It was part of Ballymacarrat, a largely working-class and Protestant area, with its Iron Works, Vitriol Works, Rope Works and Textile Mills. Tricia was informed by a Senior Research Fellow at Queen’s University that Laggan Village was on the South Bank of the Lagan River, a Protestant working-class area that included Ballarat Street, Dungevan Street and Bendigo and Carrington Streets. The map Tricia has is a fairly modern one; it includes Albertbridge, one of the bridges crossing the Lagan but that bridge was not finished until 1890. In the recent ‘Troubles’, the area was a ‘narrow ground’, a battleground for sectarian conflict. It has since been rebuilt. I doubt if Mary would recognize it, if she returned today. Mary appears not have carried any of that ‘venom’ with her. Her common-law husband, William Ashton, was a Roman Catholic and her children were baptised in the Church of England. Her parents, Jimmy McConnell and his wife, Fanny, were ‘hard-working, decent people’. But Belfast would be no earthly paradise, and Laggan village would be their deathbed. Tricia, I’ve tried to find out a bit more about Belfast during the Famine years. I haven’t bought this book, just seen bits of it via Google; Christine Kinealy and Gerard Mac Atasney, The Hidden Famine. Hunger, Poverty and Sectarianism in Belfast, 1840-50, Pluto Press, 2000. (The authors also have a chapter in the Atlas of the Great Irish Famine). They explain Belfast did not escape ‘the devastation triggered by’ the Famine which is something not widely recognized by historians. Nearly 1500 people died in Belfast workhouse during 1847 (Mary would have seen many of them die). In the three months between late December 1846 and March 1847, during a very bad winter, nearly 280 thousand quarts of soup and 775 cwt of bread was given to the hungry through Belfast’s soup kitchens. “By the end of March, over 1,000 “wretched-looking beings” each day were receiving free rations of bread and soup at the old House of Correction“. The Belfast Relief Committee knew that more than food was needed.”There are to be found a vast number of families…who have neither bed nor bedding of any description–whose only couch is a heap of filthy straw, in the corner of a wretched apartment”. Now imagine you are 17-18 year-old Mary McConnell in late 1846, early 1847. Your dad died a year ago and you and your mum have survived, only just. In that desperately cold winter, your mum died too. You lost your job in the Flax Mill. What would you do? What do you think Mary did? Fight tooth and nail, as a street kid? Become a prostitute, at seventeen years of age? (that is still uncertain). Develop an obscenely sharp and cutting tongue to protect herself from rivals and predators? “That’s my fucken crust of bread, wee lad. Touch it and I’ll cut yer balls off”. Use soup kitchens; there was one in Ballymacarrat. Get into the workhouse when the cold months came. She was in Belfast workhouse “16 months previous to her emigration“, that is since early 1847 (Barefoot, 1, p.71). But then she learned of the Earl Grey scheme, and with other street-wise young inmates, decided Australia was the place to go. Some of her shipmates, the Hall sisters, Rose McLarnon and Eliza Mulholland also had an association with Ballymacarrat. None of Douglass’s ‘troublemakers’ was allowed to disembark at Port Jackson. All of the orphans had to stay on board whilst the Sydney Orphan Committee called Surgeon, Matron, and Ship’s Master before them. They decided the feisty, rebellious, pilfering, potty-mouthed Belfasters should be kept separate from the others and sent immediately into the hinterland. Mary would be sent by steamer to Maitland, with eleven others, Ellen Rooney, Eliza Conn, Mary Black, Anne McGuire et al. Another thirty seven would be sent to Moreton Bay. Did Mary ever meet any of the others again? Would she have recognized them if she had passed them on the streets of Maitland in the 1880s? One wonders too if the recalcitrant Belfasters suffered the same punishment as those observed by James Porter when he travelled to Moreton Bay as cuddy-boy on board the Eagle towards the end of 1849. “There (sic) hair had been cut short…consequently they were afterwards called ‘short grasses’. Their dress consisted of a plain cotton gown with white spots which hung loose from the neck to the feet. They were covered with heavy hob-nailed shoes. Each girl if she had any idea of adornment had no means of carrying it out”. It was a common punishment for convict women. We’ll take up the story of Mary’s life in the Hunter Valley, next time. This entry was tagged Ballymacarrat, C. Kinealy & G. Mac Atasney, Earl Grey orphans, Irish Famine orphans, Jaki McCarrick's "Belfast Girls", James Porter, Laggan Village, Maitland, Maitland Mercury, Mary McConnell, Mount Vincent, Otway Report, Sawyers, William Ashton. Bookmark the permalink. I am sorry, bad proof reading on my part. I’m enjoying reading your blog as well. Thank you. Hi Trevor; it is OK to leave my original comment. It might get the attention of some relatives that I have never met or know nothing about and so broaden my knowledge of my Orphan Girl, Margaret Sweeney. Lovely to hear from you Gwendoline. any news is most welcome. Great. I’ll put something together soon. They set down roots in the Bathurst / Rockley area and had many children. Neither is related to me, and only distantly to my cousin so there will be other researchers much closer to their stories. Gwendoline, If you have a look at the comments on the ‘About’ page you’ll notice a recent one from Peter where he mentions the Lady Peel. Maybe leave a comment for him there and hope he reads it?? Post 7c …last two thirds of it will give you an idea about the voyage. There may be a Surgeon’s report of the Lady Peel in NSW State Records. It would be worth checking. Hi Guys, I guess I’m the ‘Peter’ that Trevor is referring to. His replies to me have been so helpful & given me an absolute boost in tracking down the right sources. Woohoo! I’m having a whale of a time in unearthing information about my ancestor Eliza Fitzpatrick who arrived in Sydney 3 July 1849 on the Lady Peel. She was in the Athy Workhouse. The Athy Heritage Museum has been brilliant in its advice. I’ve found Eliza’s baptism in the Irish Catholic records on line. I was going to ask Trevor or Perry at the Irish Irish Famine Museum in Sydney whether they knew of any ship’s diaries for the Lady Peel’s voyage. I’ll search that out. In fact I’m also discovering quite a bit about another Famine orphan Ann Trainer who arrive in Melbourne 25 February 1850. She was in the Magherafelt Workhouse. I’ve had brilliant help from the Maghera & District Genealogical & History Society. Members on its Facebook page have given me a number of links to search. I think I’ve found Annie’s natural father through Griffiths Valuations & location of his property. I have a number of family lines i’m working on & I have to pause & write up my findings. All very exciting. It pays to keep trying various word-search combinations on Google. I tried ‘Henry Parker drayman’ & found a wealth of researched information about his wife Eliza Fitzpatrick & their/her various children. One of them Mary Ann Parker was an inmate of the Newcastle Industrial School for Girls. There could well be other Irish famine orphans or offspring at this institution. It’s incredibly well-searched. The references have led me to lots of newspapers accounts which for some reason never showed up when I did Trove Newspaper searches. I have been looking at your site for quite some time now and find it most interesting and very informative. I have seen that in today’s post (32) you mention a Brian Andrews from the Hunter. You wrote that you have lost contact details so this may help you. My wife and I were fortunate to meet Brian last year when we attended a family reunion for the CLARK/Kelly family at Largs. We met him at the Weston Historical Society. I think he is failing a little bit but still OK. I have known the family for many years. In fact we are related to him through his mother, Ellie who was a Landrigan. In fact his parents retired to Evans Head, a lovely little fishing village just south of Ballina. His first cousin, Jim, was a bookkeeper/accountant for us in our business for some years until he died of cancer. Two of Dad’s aunts married the same Jeremiah Landrigan (Annie died about aged 32). Together there were 10 children. As well, a Mary Landrigan married into our Kelly family from the Hunter. Brian was a wealth of info for us in our research for my wife’s family, the Lynn family of English origin, in the late 1800’s, coal miners originally. If you have trouble finding him, he has a niece named Jennifer Collier, 4933 8990. I am descended from Margaret Sweeney, from Ballyshannon workhouse, came out on the INCHINNAN, 1849. There are very many descendants now. Her son and second child, Edward Dougherty is my great grandfather. One of my ambitions is to find a photograph of her. Still no luck, even though she died in 1904. A gem I did not come across, quite fortuitously via an unrelated source, a real coincidence, is a small card sent to a priest to say masses for her daughter who died in her late teens. Her name was Margaret Dougherty as well. Her mother has signed it as Mrs Dougherty so I have an original signature of hers on which is dated her daughter’s death, 19th May 1889. I assume it was written not long after that. If it interests you, I could scan it and email it to you. Brian Andrews is a lovely man who I suspect was thoroughly deserving of the OAM. I hope this info is useful and that I have not bored you with my ramblings. Lovely to hear from you Bill and thank you for all the information. I hope it’s ok to allow others to read. Oops – did not think that my comment would go public, but no harm done. I just noticed that I incorrectly added the word “not” when I was referring to the “gem” which I have. I will send it to you via email and you may be able to add it in. I do not have Brian Andrew’s email. I will contact some family members or Brian himself to get it. Also when I mentioned Weston Historical Society, I should have written, Kurri Kurri, even more specifically, the Coalfields Heritage Group, beside the High School. Thanks for your interest and reply. Thanks Bill. I’ve removed your earlier message.